“Our predecessors were not fools, and we should take satisfaction from adding a brick or two to an existing edifice, not in imagining that we built the whole thing ourselves” (Wilkie, 1986). an activity that is natural to or the purpose of a person or thing. Attempts to define human foot function have a long history. This article provides a brief overview of these attempts and their strengths and weaknesses, ending with a new definition of a functional human foot. Ellis (1889), supported later by Wood Jones (1944) and McKenzie (1955), described a longitudinal arch with the weight bearing area forming a half dome between the heel, medial border of the midfoot and metatarsals. Most studies of asymptomatic-functional feet provide some support for the half-dome concept during weight bearing. Morton (1935) believed the foot had five longitudinal ‘arcs’ formed by the calcaneus and the five metatarsal bones. These five arcs formed one functional longitudinal arch that never fully flattened to become part of the weight-bearing area. Morton’s observations are true for most western, habitually shod adults, but according to the next definition, characterise a rigid and dysfunctional foot. Bankart (1935) believed a natural foot had a flexible and compliant arch that only appeared as an arch when unloaded, but which completely flattened in weight bearing, providing a large contact area with the ground. He believed an arch that did not flatten was dysfunctional and subject to injury due to the strain imposed by its resistance to flattening. Such footprints are rare and generally observed only in some habitually-barefoot populations. In contrast to previous definitions, Dickson and Diveley (1953) believed the foot comprised three arches: 1. A medial longitudinal arch from heel to first metatarsal head; 2. A lateral longitudinal arch from heel to fifth metatarsal head and; 3. A transverse arch from fifth to first metatarsal head. These arches provided a ‘tripod’ over which weight is suspended without any distinct flattening. This model is surprisingly still popular, despite the ‘hot spot’ pressure pattern being associated with numerous pathologies. 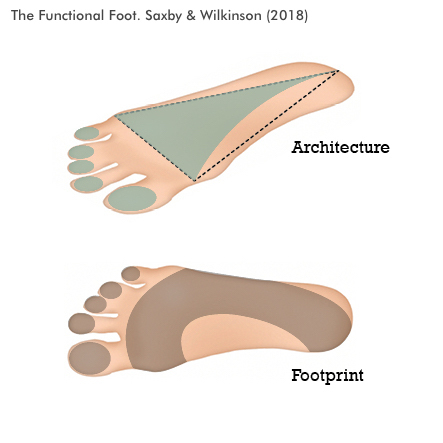 One problem characteristic of all four definitions is the single focus on arch function, and the failure to include toe function. Only Lambrinudi (1938) recognised the essential role of the toes in stabilising the arch function described first by Ellis then Wood Jones. Only the toes, in combination with the half-dome arch, can bring stability to the entire foot. The functional foot provides a half-dome weight-bearing surface that is supported by the stabilising action of the toes. Bankart, A.S.B. (1935). The treatment of minor maladies of the foot. The Lancet, Feb 2, 249. Dickson, F.D and Diveley, R.L. (1953). Functional Disorders of the Foot 3rd Ed. Philidephia: Lippincott. Ellis, T.S. (1889). The Human Foot: Its form and structure. London: J.A. Churchill. Lambrinudi, C. (1938). The feet of the industrial worker. The Lancet, Dec 24, 1450. McKenzie, J. (1955). The foot as a half dome. British Medical Journal, April 30, 1068. Morton, D.J. (1935). The Human Foot: Its evolution, physiology and functional disorders. London: Oxford University Press. Wilkie, D. R. (1986). Muscle function: a historical view. In Jones, N. L., McCartney, N. & McComas, A. J. (Eds.) Human muscle power. Champaign: Human Kinetics. Wood Jones, F. (1944). Structure and Function as seen in the Foot. London: Bailliere, Tindall & Cox.